In our previous ship tip, Gwen wrote about cables, housing and accessories. In this tip, she will provide an overview of front and rear derailleurs. This shop tip is all about creating a basis for more in-depth knowledge. Whether you’re working on a bike you already own or are preparing to buy a new one, it’s very helpful to be familiar with all the different types of components. Knowing their names, their uses, and their limitations can help you be prepared to ask the right questions and make well-informed decisions. Front derailleurs are used to shift the chain up and down on the chainrings (the gears which make up the front half of the drivetrain). 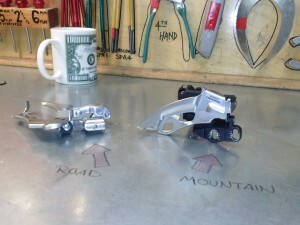 Front derailleurs are actuated by levers called shifters (we’ll be covering shifters in an upcoming shop tip). There are a few different ways that front derailleurs can attach to a bicycle, and a few different types and sizes. Clamp-On, Bolt-On and E-Type: There are three categories into which most front derailleurs fall. They will either be clamp-on (not pictured- this is the most common type), bolt on (pictured on the right up top) or E-type (pictured on the right, bottom). Clamp-on front derailleurs have a circular clamp which wraps around the bicycle frame to hold the derailleur in place. There are three main diameters of clamp. 6, 31,8 and 34,9mm. Braze-on front derailleurs come in either 1-bolt or 2-bolt types. The 1-bolt types are used on road bikes and the 2-bolt types are for mountain bikes. These derailleurs bolt on to specially placed tabs which the manufacturer has installed on the frame. Cable Direction: Front derailleurs can be “top-pull”, “bottom-pull” or “dual-pull.” The top/bottom refers to the direction from which a cable should come from to actuate the front derailleur. Most often, this is determined by the location of stops (see below) or routers on a bicycle’s frame. Dual-pull derailleurs work with cables which come either from above or below. In addition to cable direction, different derailleurs have different directions that they swing. The swing direction will impact which derailleurs can be used on which bike frames. 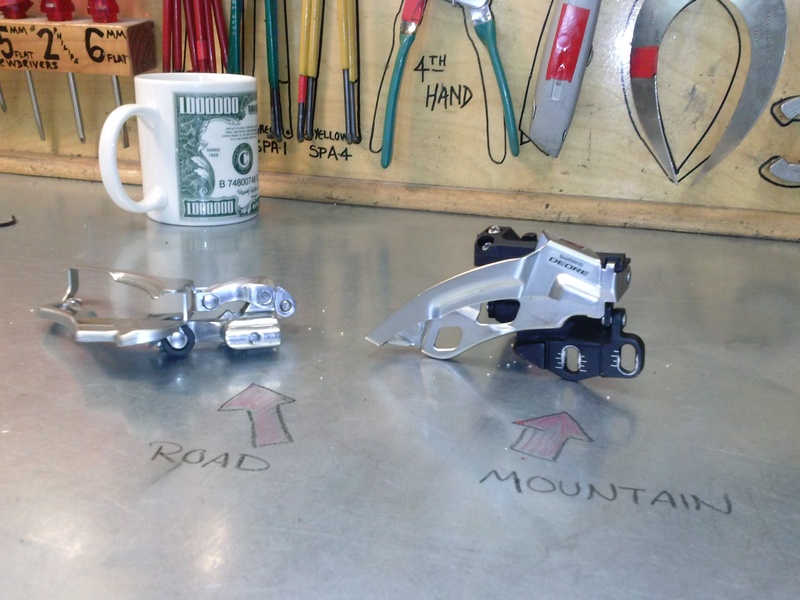 It’s important to replace a “top-swing” derailleur, which swings upwards, with another top-swing derailleur. The same is true of “bottom-swing” derailleurs, which swing downwards. Rear derailleurs are used to shift the chain up and down on the gears which make up the rear half of the drivetrain. They are also the part of a bike which keeps the chain tensioned. All rear derailleurs bolt on to the “derailleur hanger”, which is a small tab which is either part of or bolted onto a bicycle frame just below where the rear wheel attaches. Like front derailleurs, rear derailleurs are actuated by levers called shifters. There are a few different types and sizes of rear derailleurs. Size: The size of a rear derailleur is judged primarily by the length of its “cage”. The cage is the lower part of the mechanism which holds the “pulley wheels” in place. It is the part of the derailleur through which the chain travels. 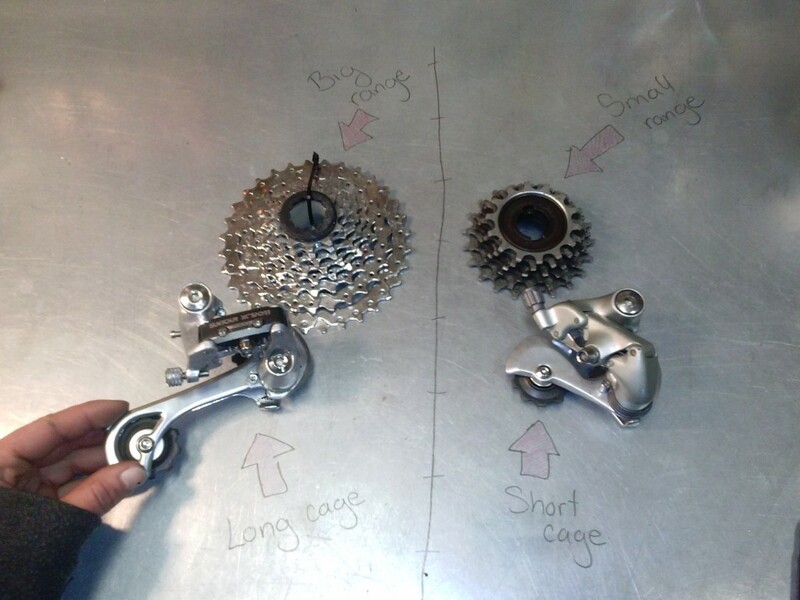 Derailleurs with longer cages have a wider range of motion, and so can move a chain across more, and larger, gears. Derailleurs with shorter cages aren’t able to move a chain as far, and so they have to be used only with smaller gears. 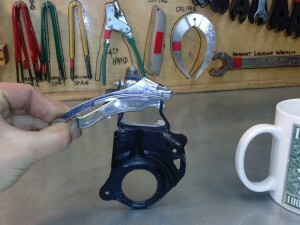 A derailleur with a longer cage will also need to be paired with a longer chain than a derailleur with a shorter cage. Brand Compatibility: If you are working with an “indexed” system (one which clicks as you shift, rather than gliding), you will need a derailleur and shifter which have a compatible “rate of pull.” (Some systems require a different spacing between the gears than others too.) Many derailleurs work with shifters which pull cable at a ratio of 1:1, and many others pull at a rate of 1:2. The manufacturer’s instructions should let you know which you are dealing with. (There are also a few other systems that work with neither 1:1 nor 1:2. Here’ a link which provides more information- http://www.sheldonbrown.com/drivetrain-mixing.shtml. If you are working with a “friction” system (one which is not indexed), the rate of pull is not an issue. Chain Compatibility: All rear derailleurs are designed to work with either 3/32nd-inch chain (for bikes which have 5, 6, 7 or 8 gears in the back) or with 9-speed, 10-speed or 11-speed. Using a rear derailleur with a type of chain other than the one that it is designed for will not work well and sometimes it won’t work at all. Most derailleur manufacturers will have information (“specs”) for their products available online – and it is important to check, either online or at your local bike shop. Stay tuned for more bicycle anatomy tips in the future!